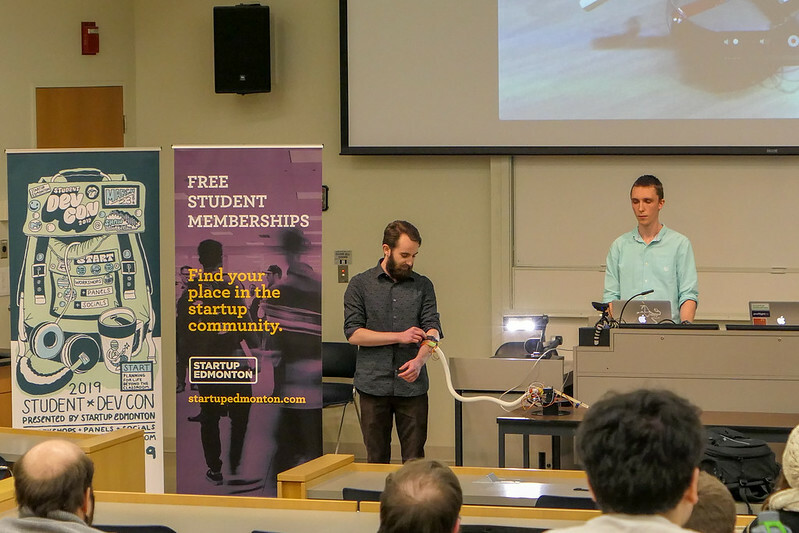 Edmonton’s 44th DemoCamp took place on Tuesday night at the Centennial Centre for Interdisciplinary Sciences (CCIS) on the University of Alberta campus. It was the first DemoCamp of 2019. You can see my recap of DemoCamp Edmonton 43 here. CleanNow is aiming to be the Uber for house cleaning. They launched in early December and now have more than 400 active customers over the last 30 days. CleanNow is trying to solve the problem of finding a reliable house cleaner, so they demoed some of the features that support that. The backend is written in Code Igniter and they have a PHP API. Payments are done in-app with Stripe. CleanNow is launching next in Calgary, hopefully in March. The World’s Opinion, or two for short, was inspired by election polls and how inaccurate they can be. “Everyone has a phone so why can’t we get a sense of what people are thinking?” Noah said. The app is currently iOS only (built in Swift from scratch) and allows users to vote on questions by swiping left or right, to ignore or skip questions by swiping up, and to save a question for later by swiping down. The question editor looks like the Instagram story interface and allows for thumbs up/down or two-choice questions. Everyone can see the breakdown of responses for a question, including some basic demographics like gender. The backend uses Google Firebase, and Noah said he’ll probably do an Android version at some point. Sparkshot is an art discovery platform with a twist. Artists create artwork, upload it to the site, and behind the scenes Sparkshot will cover it in black pixels. Users can then purchase pixels (using Bitcoin micropayments) to reveal the art over time (price per pixel is set by the artist). Each piece looks a bit like a jigsaw puzzle until it is fully revealed. Once finally revealed, anyone can see and share the png file as well as all of the messages the buyers posted along the way. Because it uses Bitcoin, there’s no need to know who is buying the pixels, so there’s no account to create. Jarret and Dean demoed Forkdrop.io at DemoCamp Edmonton 42, another Bitcoin-related project. I remember participating in hackathons and it seemed like an achievement to get the entire team setup in source control and have a simple website built. How things have changed! Eric and Mark showed us their hackathon project, which is a gesture controlled robotic arm. They built a wristband with eight pressure sensors to measure muscle movement that sends data to an Arduino micrcontroller and on to a computer with a classifier to convert the muscle movement into four different motions for the robotic arm. They told us they currently measure 200 data points for each position. In the future they’d like to make the wristband wireless and they also talked about prototyping their own microcontroller boards to speed up signal processing. Amazing. Next up was RevonTech with Animus, which is a small device that can power a string of up to 150 LEDs in sync with music. They 3D printed the case and designed the board themselves to ensure that power consumption was kept to a minimum (it can run continuously for over 6 hours). Animus can control the lights based on frequency and also does some beat detection. Using the mobile app, users can choose from a collection of patterns. Patrick told us they wanted it to be a plug-and-play kind of device, for people who don’t know all the tech, but want to take advantage of it at a concert. We also learned the hardware supports far more than they have been able to implement in software thus far. Animus is about to launch in beta! I really enjoyed all of the demos! It was my favorite kind of DemoCamp: a nice mix of software and hardware. Student DevCon is coming up on March 23, 2019 at the Edmonton Convention Centre. Tickets are just $35 and include all sessions, swag, breakfast, and lunch. Business Model 101 is Startup Edmonton’s most popular workshop. It is running twice per month for the next few months, and new for 2019, you can attend in Riverbend or Meadows, so you don’t need to travel downtown. There are plenty of upcoming community meetups listed at the Startup Edmonton meetup site. 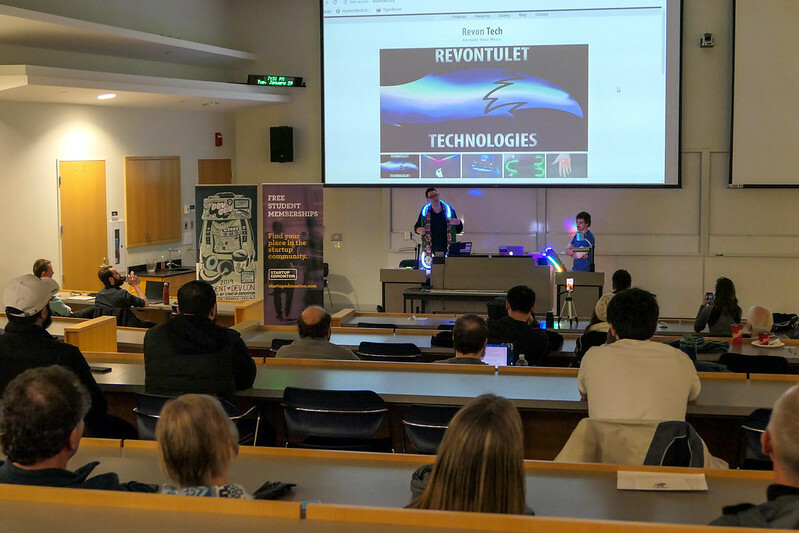 DemoCamp Edmonton 45 is scheduled to take place on March 12, 2019. You can also check out the Tech Roundup for the latest headlines & happenings in Edmonton’s technology community every Tuesday. Here’s the latest edition. If you’ve got something to show, apply to demo at a future event. See you at DemoCamp Edmonton 45!